I was interested to read FoodNavigator-Asia’s account of food industry comments on what to do about obesity is Australia. By all reports, two-thirds of Australian adults meet definitions of overweight or obesity, along with a quarter of all children. A Senate committee is collecting ideas about what to do about this, including those from the food industry. Food-Navigator-Asia has taken a look at some of the submitted comments, particularly in light of comments from medical groups encouraging social, environmental, regulatory and medical interventions, and arguing that food companies should be kept out of formulating policies due to their inherent conflicts of interest. The article quotes three companies. Coca-Cola Amatil says taxes would be counterproductive because it is already reducing the sugar in its products. Fonterra (a dairy company) says obesity is not the problem; instead, underconsumption of dairy products is the problem. Nestlé [no relation] blames consumers; it is trying to reduce salt and sugar in its products but the public isn’t buying them. It also blames government, which it says should do a better job of educating the public about diet and health. Obesity poses a formidable problem for food companies making junk foods. They have stockholders to please. They cannot be expected to voluntarily act in the interest of public health if doing so affects profits. That is why food companies should have no role whatsoever in developing policies to prevent or treat obesity. What should we think about the food industry’s new Sustainable Food Policy Alliance holds promise? 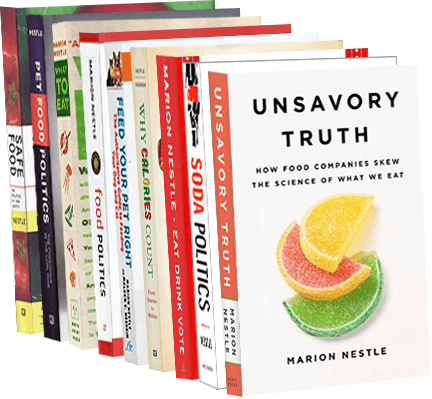 Danone North America, Mars Inc, Nestlé USA (no relation), and Unilever US have left the Grocery Manufacturers Association to form a new organization, the Sustainable Food Policy Alliance. Urge policymakers to ensure the Farm Bill and other farm policies emphasize water quality and conservation issues, improved soil health, and renewable energy (particularly wind and solar). Explore the economics of sustainability, including financial incentives to reduce emissions and transition to low-carbon alternatives and to create value for farmers, ranchers, and others. Advocate on behalf of environmental policies at the state, national, and international levels, including the Paris Climate Agreement and Clean Power Plan. to see how the four companies address more inconvenient environmental and public health policies, such as limits on bottling water from national forests or mandated, front-of-package nutrition labeling. Those policies could potentially threaten their bottom lines — an issue Danone’s Lozano said his company did not face with its current efforts around sustainability. Let’s give them credit for going after the low-hanging fruit first…But the real questions are what they will really do, and when. Forbes has published a ranking of the top 2000 global companies (all kinds, not just food) by a composite score of revenue, profit, assets, and market value. Forbes summarizes some of the information for food processing companies. By its measure, Anheuser Busch, Nestlé, and PepsiCo are the top three. Coca-Cola, however, ranks #209, a big drop from last year’s #86. It did not have a good year last year. You can sort the list by name or category. I did that for four categories: Beverage, Food processing, Food retail, and Restaurants. Walmart does not show up as a food retailer; Forbes considers it a Discount Store, even though food accounts for nearly half of Walmart’s revenues, nearly $200 billion a year. Here are the food, beverage, retail, and restaurants that show up as among the top 250 companies, worldwide. I only included sales and profits in this table; you would have to add in assets and market value to understand the ranking system. Food, beverage, retail, and restaurant companies among the biggest 250 companies worldwide. *About 40% of sales are from food. This is why Walmart is the elephant in the food-business room. Wandering around in the Rehavia neighborhood in Jerusalem, I saw a local park with a just-starting composting program. Down the street from the official residence of the Prime Minister (that would be Benjamin Netanyahu), is the headquarters of the International Jewish Vegetarian Society. I’m surprised at how little food advertising I’m seeing. This restaurant overlooking the crater at Mitzpe Ramon is an example that seems typical. Nestlé (no relation) ice cream bars are everywhere. Coca-Cola is everywhere too, but this venerable truck is the only one I’ve seen. This one was in Tel Aviv. I consider the results of studies showing remarkable health benefits attributed to single foods or single nutrients to be “nutrifluff”—fun, but not necessarily meaningful unless you are eating a healthy diet anyway. Dark chocolate reduces heart disease risk: Everybody loves this one—an excuse to eat chocolate (but only the dark, bitter kind, alas). This comes from a Cochrane meta-analysis of studies on the role of flavonols in blood pressure. It concludes that chocolate eating is associated with a small reduction in blood pressure of 2 to 3 mm Hg—but only in short-term trials. How many of the studies were sponsored by chocolate companies? The report doesn’t say. Apple peel extracts reduce blood pressure: Apples also have flavonols. These were test-tube studies. Note: Eating fruits and vegetables in general is associated with lower blood pressure. Goji berries promote immune function in the elderly: This one, done by researchers working for Nestlé (no relation), tested daily supplements of “lacto-wolfberry” on immune responses to influenza vaccine. I’m assuming Nestlé must be planning to market this supplement. What does all this tell us? These kinds of studies confirm that eating fruits and vegetables is good for health (I think we might have known that already). But the main (perhaps only) reason for doing such studies is for marketing purposes, which is why food companies sponsor them. .…The FDA concludes that current scientific evidence is appropriate for consideration of a claim regarding the relationship between the consumption of 100% whey-protein partially hydrolyzed infant formula and reduced risk of atopic dermatitis. ….We’re proud to say that Gerber Good Start is the first and only formula brand made from 100% whey-protein partially hydrolyzed. In contrast, most other routine milk-based formulas are made with intact cow’s milk protein. Translation: Some infants are allergic to the proteins (whey) in cow’s milk. Treating the proteins so they are split apart into smaller fragments (partial hydrolysis) apparently destroys some of their ability to elicit allergic immune reactions in the skin. The FDA has concluded that the relationship between 100% whey-protein partially hydrolyzed infant formulas and the reduced risk of atopic dermatitis is uncertain, because there is little scientific evidence for the relationship. Partially hydrolyzed formulas should not be fed to infants who are allergic to milk or to infants with existing milk allergy symptoms. Blame Congress for this one. It insists that the FDA allow “qualified” health claims” for which scientific evidence is uncertain. If you want to know why the FDA can’t seem to get anything done, take a look at what it’s staff had to do to respond to the Gerber petition. Graduate students take note: this is an exhaustive review of scientific studies on the relationship between hydrolyzed whey protein and infant skin allergies. Why would Gerber’s place a hugely expensive full-page ad in national newspapers to celebrate a decision like this? Because it knows that any health claim, no matter how poorly substantiated by science, gives it a competitive advantage. This is reason enough to promote breastfeeding.